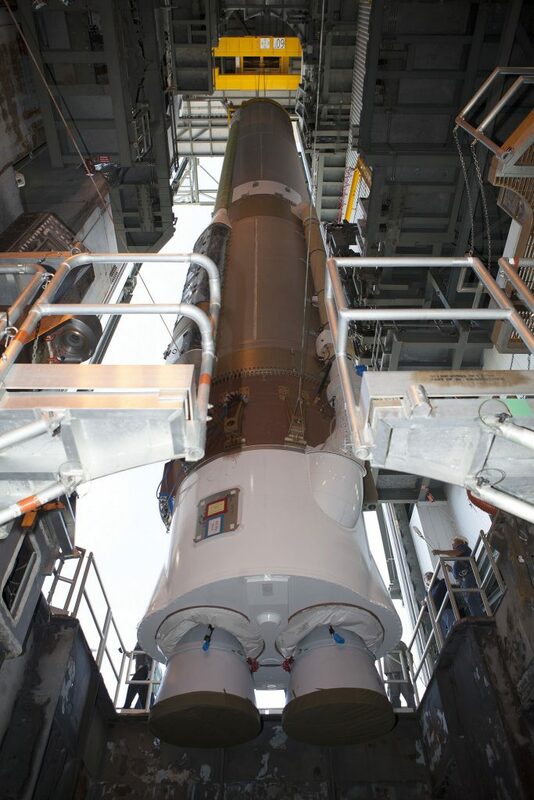 CAPE CANAVERAL — With the performance hit on the Atlas 5 rocket’s most recent flight last month now isolated to a faulty valve, preparations to resume the manifest are underway as United Launch Alliance workers stack the next booster for blastoff this summer. 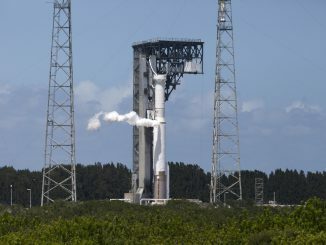 The Mixture Ratio Control Valve (MRCV) governing the blend of RP-1 kerosene fuel and liquid oxygen flowing into the main engine of the Atlas 5 rocket “caused a reduction in fuel flow during the boost phase of the flight,” officials announced today. During the March 22 launch, the first stage shut down six seconds early and the Centaur upper stage had to improvise by burning a minute longer to achieve the planned orbit. The payload — Orbital ATK’s commercial Cygnus cargo freighter — successfully reached the proper orbit and did its rendezvous with the International Space Station to deliver over 7,000 pounds of supplies for the resident crew. 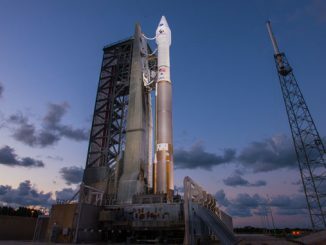 Engineers continue to evaluate the details surrounding the valve problem, and ULA is developing inspections for the Mixture Ratio Control Valve and actuator, expected to be complete in early May, to implement on the next vehicle. “We observed nothing unusual in the mixture ratio commands until late in the first stage flight,” officials said. FOD, or debris, impeding the valve’s operation has been ruled out as unlikely and non-credible. The time to understand what caused the anomaly has delayed the next Atlas on the manifest from its original May 5 launch date until late June. 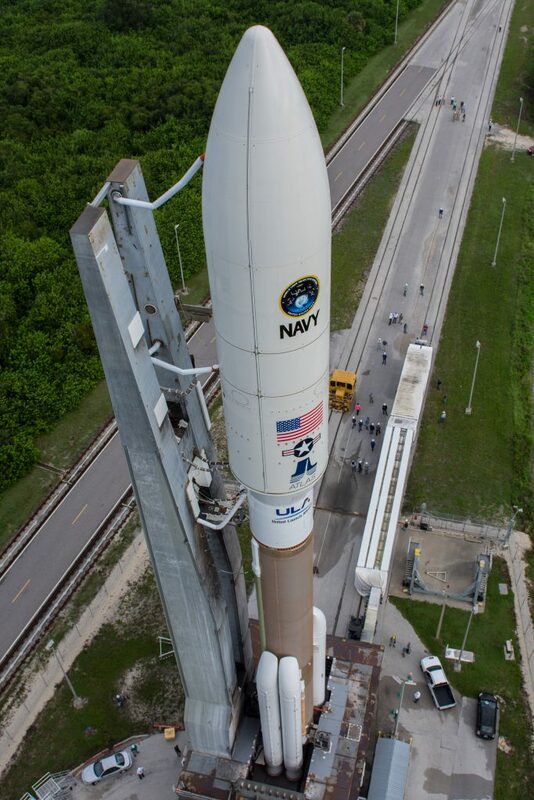 That upcoming rocket, designated AV-063, will launch the 15,000-pound mobile communications satellite, named MUOS No. 5, into space for the U.S. Navy. Stacking of the vehicle began last Friday with the first stage being hoisted atop the mobile launch platform at the Vertical Integration Facility at Complex 41. The five solids were mounted this week and the Centaur upper stage will be added soon. 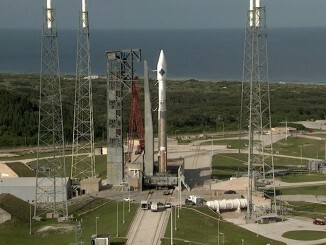 The payload will be installed a week before flight to complete the 206-foot-tall launcher. Putting the first stage up vertically will allow additional inspections of the Mixture Ratio Control Valve and confirm associated components are ready for launch. The launch will complete the planned globe-spanning constellation of five Mobile User Objective System spacecraft for a new voice, video and data relay network based on cellular telephone technology. Built by Lockheed Martin, MUOS No. 5 will go into service providing legacy UHF communications to users in the Indian Ocean region and serve as an in-orbit spare for the Navy’s new “rugged smartphone” system. Four previous MUOS satellites launched since 2012 by Atlas rockets — serving the Pacific, U.S., Atlantic and Indian Oceans — form the worldwide cellular phone network. MUOS No. 5 will be capable of relocating itself within the geosynchronous belt to replace any of its four sister-satellites if ever needed. Getting the massive payload to the intended dropoff point — an elliptical orbit of 2,373 by 22,237 statute miles at 19.1 degrees inclination — requires the very powerful Atlas 5 rocket in its 551 configuration. That means a vehicle with five strap-on solid rocket boosters for a total liftoff thrust of two-and-a-half million pounds. The Centaur upper stage will fire three different times to heave the payload ever higher in the three-hour ascent. The Atlas 5 schedule continues to show all 8 additional launches planned this year despite the MUOS delay, including the time-sensitive departure of NASA’s OSIRIS-REx asteroid sample-return expedition on Sept. 8. MUOS 5 and a classified deployment for the National Reconnaissance Office are planned this summer, followed by OSIRIS-REx and a commercial Earth-imaging satellite in September, launch of a missile-warning satellite for the Air Force, a next-generation civilian weather satellite, a commercial broadband Internet-from-space craft and another NRO mission at year’s end. United Launch Alliance’s next launch will be the Delta 4-Heavy on June 4, some time between 2 and 7 p.m. EDT (1800-2300 GMT), to deploy the National Reconnaissance Office’s NROL-37 spy satellite mission.